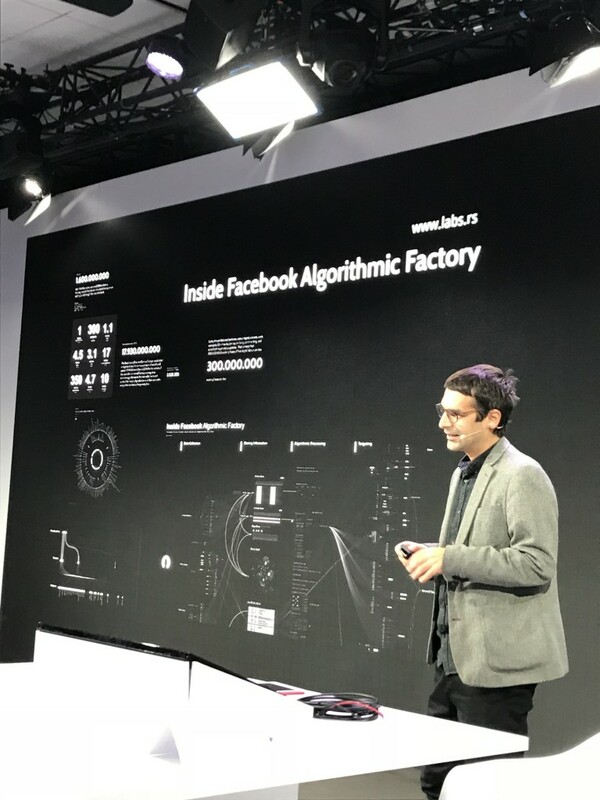 “Our social and business communications are edited by tech,” Vladan Joler, director of Share Foundation, stated at the Sibos Innotribe panel, How does Facebook know you better than you know yourself? Social media and tech giants such as Google and Facebook employ armies of data scientists and engineers creating the complex algorithms to gather, process and analyse the data to a granular level. And they have the financial power to attract the top talent, Joler observed. Our capacity to really understand what’s going on inside these companies’ “black boxes” is very limited, he said. Most of us are on some sort of social media these days. It is not obligatory, of course, but it is now almost an integral part of life today. If you are not of Facebook or LinkedIn, it is suspicious. When you apply for a job or go on a date, your employer or your date is very likely to look you up on social media. There is no surprise, then, that in terms of population Facebook is bigger than the US. In 2015, Facebook had 1.6 billion active users, while the US had 323 million citizens. So what is this country of Facebook? Is it a democracy? Does it have a government and if so, how do we communicate with it? Since 2004, Facebook had over one trillion likes. On a daily basis, 350 million photos are uploaded on Facebook; 4.7 billion posts are shared; one billion locations tags are done and ten billion messages are shared. “Facebook’s black box defines new forms of labour, exploitation and generation of enormous amount of wealth and power – $17.9 billion in 2015 – for the owners of this immaterial invisible factory, creating deep economic gap between the ones who own and control the means of production and their users who really often live below the poverty line,” Joler said. All this data is put through the Facebook algorithms that try to make sense of who and what you are and then monetise that information. It takes into account your profile (who you are, or, to be more correct, how you portray yourself/perceive yourself), your actions (which are more realistic representation of you) and your device’s information (a digital footprint). Unlike traditional newspapers and magazines, Facebook enables “nano targeting” for advertisers, i.e. advertisers can focus on individuals or very small groups of individuals. In comparison, the traditional media can offer advertisers much broader target groups, for example, teenagers or women of a certain age group, or people with a certain income and so on. But Facebook can drill down to very specific behaviours and interests on each individual – and this is a fundamental difference. The algorithms play around with data and contents, trying to understand the places you visit (home, school, work etc), match keywords, social connections – and build the patterns and routines, and extract the anomalies. By analysing your spend, where you live, work, shop and socialise, what your hobbies are, what music you listen to etc enables Facebook to put a price tag on you, Joler says. How much are you worth in the Facebook land? Lloyds Banking Group is to allow customers to upload images of identification documents required as part on an online account opening application, removing the need to visit a branch. Initially the new electronic identification and verification checks, which will start to be rolled out to customers from next week, will be available to customers who want to add an additional party to an existing account.